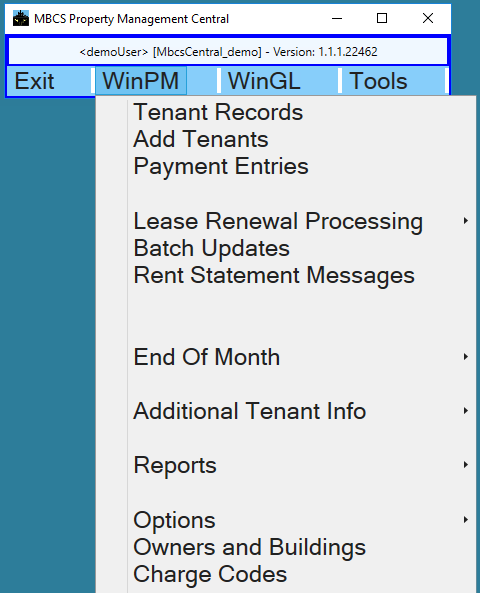 If you are a current user of WinPm this should look familiar to you. Whether or not you are, Owners and Buildings is the logical place to begin. So click on that selection to bring up the Owners and Buildings window. Double click an Owner or Building to see the information associated with it. You may also highlight one and click on the corresponding EDIT button. Adding an Owner or Building is done by clicking on the appropriate ADD button. Of course in this Demo you will not be able to save changes to existing Owners and Buildings or actually add the Owners or Buildings but you can modify what you see on the various add/edit windows. As you run through this Demo you will notice that if you move and/or resize a window that will be remembered and take on the same location and size the next time that you display it. If that does not happen, especially between sessions, it simply means that another user of the Demo has done the same. In live production each user's window positioning will remain constant.